By phone (212) 488-3300, or at the theatre box office. 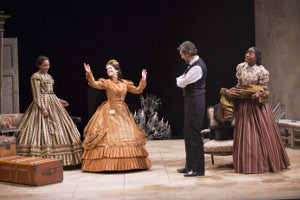 (L-R) Sameerah Luqmaan-Harris as Elizabeth Keckly, Naomi Jacobson as Mary Todd Lincoln, Thomas Adrian Simpson as Abraham Lincoln and Joy Jones as Ivy in Arena Stage at the Mead Center for American Theater’s production of Mary T. & Lizzy K. March 15-April 28, 2013. Photo by Scott Suchman. Thanks to Steven Spielberg’s Oscar winning film Lincoln, and in no small way to President Obama himself who latches onto our 16th president at every political turn – Obama swore his oath of office on Lincoln's bible, gave his State of the Union address on Lincoln's birthday, and frequently reads the handwritten Gettysburg Address that hangs in the Lincoln Bedroom, as he tells us – all things Lincoln, from the issue of slavery, Lincoln’s fight to pass the 13th Amendment, to his troubled relationship with his wife Mary Todd, in book, film, and on the stage, is currently a hot topic. The most beautifully written and deeply felt of these Lincoln retellings is Tazewell Thompson’s play Mary T. & Lizzy K at the Arena Stage in Washington DC. Here the playwright, who is also the director, awards the play’s starring roles to Lincoln’s wife Mary Todd, her seamstress and confidant Elizabeth “Lizzy” Keckly, and Ivy, Lizzy’s young assistant, both freed slaves. While Lincoln himself (Thomas Adrian-Simpson) does make a couple of star turn appearances, and gets to co-star in one particularly emotionally revealing scene with his wife, it is primarily through the heart-rending experiences of these three women, that the playwright tells his story. No doubt the play, a beautiful blend of fact and fiction, will soon be making the rounds, and winning acting awards, to regional theatres around the country. When the lights do go up we see a large room with high whitewashed walls. The room is mostly empty, save for one chair, usually occupied by Lizzy K and her fabric samples, a scattering of large trunks, packing cases, hat boxes, and a crystal chandelier resting on the floor at the back of the stage. The double duty set – it works both as a large room in the White House, as well as Mary T’s room at an asylum – cleverly designed by Donald Eastman, if you ask me is a stroke of genius. In one fell swoop it reinforces the coming and goings of Mary T’s mind, and, as the history books tell us, hints at her excessive shopping sprees in which she would by a dozens of articles of clothing. Naomi Jacobson as Mary Todd Lincoln in Arena Stage at the Mead Center for American Theater’s production of Mary T. & Lizzy K. March 15-April 28, 2013. Photo by Scott Suchman. 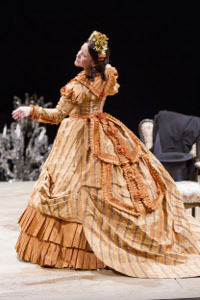 When not flashing back to the asylum, or focusing on Mary T’s frequent psychotic “episodes” much of the play’s action takes place, chillingly so, as we alone know what is going to happen, on the last day of Lincoln’s life, with Mary T is being fitted for a new dress she is to wear to Ford’s Theatre. It is during the play’s realistically portrayed fittings – all utilizing the beautifully designed authentic period gowns by costumer Merrily Murray- Walsh – that Lizzy K, with the help of Ivy (Joy Jones), demonstrates and explains, in exacting seamstress language, what steps and stitches are needed to create a fashionable gown, that that the three woman recount their contrasting lives in great detail. Both Lizzy K, who has to be coaxed into telling her story, and Ivy, having lost their children, and husbands, and families – indicative of the times – have harrowing stories to tell. And tell them well they do. Naomi Jacobson, Mrs. President, as she demands to be called, tears up the stage as she transitions from calm, to anxious, to depressed, to over the top outbursts. One minute she is lost in her own memories, the next, imperious and hateful to everybody around her. Even her husband is not safe from her tongue as she accuses him of training a generation of young men to “fall in love with killing,” and flirting with every pretty woman around him, a topic she brings up at every turn. Equally riveting are the fine performances of Luqmaan whose strength of character and determination allows her to proudly stand up to Mary T’s garrulousness without ever losing her dignity or temper, is a pleasure to behold. Jones, whose stories, one about how she lost her eye, as horrific as it is, is theatrical magic. So beautifully innocent is her demeanor while telling it, we find ourselves not only wishing for her eye to reappear, but half believing, just like Ivy does, that it will. This actress is a breath of fresh air. As Abraham Lincoln, Mary T’s put upon husband, Simpson is exceedingly accessible, down to earth, inquisitive, and deeply caring, the opposite of his wife; not at all as stone-faced and wooden as played by Daniel Day-Lewis in Spielberg’s Lincoln. Simpson’s Lincoln appears to be a lot more fun, somebody you wouldn’t mind partying with. However, as written, with little stage time, and far less words than the main players, he acts primarily as a foil for his egocentric wife. While playwright Tazewell Thompson’s direction is letter-perfect, and the poetic language of the play, specifically fashioned to fit each character, is thrilling to the ear, the play itself seems to have several endings which need to be attended do. Though each of these scenes are all play worthy – there seem to be three – they either have to be eliminated or absorbed into the body of the play so that they do not stick out uncomfortably. Hopefully this will be done before the next production of Mary T & Lizzy K.